Spotify, the leading on-demand music streaming service providing access to a catalog of more than 20 million songs globally is now compatible with Ford SYNC® AppLink™ for simple hands-free, voice-activated entertainment while driving. Spotify is the largest and most successful music streaming service of its kind globally, available in 20 countries including the United States, and with more than 20 million active users and 5 million paying subscribers. AppLink will enable Ford drivers to enjoy Spotify songs and playlists while keeping their hands on the steering wheel and their eyes focused on the road. 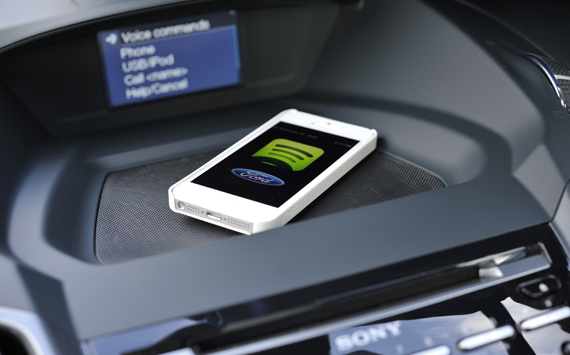 The integration with Spotify to offer the streaming music service in Ford SYNC AppLink-equipped vehicles is the company’s first direct collaboration with an automotive manufacturer. More than 1 million Ford vehicles in North America are now equipped with SYNC AppLink, enabling drivers to voice-control smartphone apps from the driver’s seat. “Spotify is a terrific addition to the SYNC AppLink ecosystem helping add even more value to the experience of driving a Ford for both new and existing customers,” said Paul Mascarenas, chief technical officer and vice president, Ford Motor Company, during the announcement of the collaboration at Mobile World Congress in Barcelona, Spain. Even Spotify’s built-in social sharing capabilities work on the road. When the Spotify app is connected and running, if a friend sends a track, album, artist or playlist to your inbox, the car will read it aloud – for example, “You have been sent a new playlist. Would you like to play it?” Answering “yes” will start playback of the sent item, which is great for when friends aren’t with you and want you to hear an album they like. Spotify is also confirmed as the first music service provider for the upcoming launch of SYNC AppLink in Europe. The updated Spotify app will be available soon in the Apple App Store.